ATLANTA, Oct. 24, 2018 /PRNewswire/ -- Randstad US today released results of a survey uncovering U.S. employees' feelings and experiences with political discussions in the workplace, and how an employer's approach to political issues can influence employee engagement and retention. The data shows that while almost half (49%) of respondents enjoy talking politics with colleagues because it helps them understand other viewpoints, 53 percent admit they limit social interactions with co-workers who have differing political beliefs. 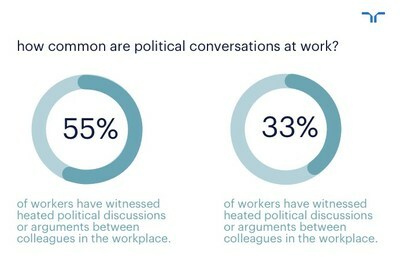 "Our study shows the topic of politics itself is extremely divisive in the workplace, reflecting our country's current polarized political climate," said Audra Jenkins, chief diversity and inclusion officer, Randstad North America. "It seems there's no escaping politics, even on supposedly neutral ground, and unfortunately this can contribute to feelings of alienation as well as deteriorating relationships in the workplace. Managers must pay close attention to workplace dynamics within their teams and be sure they're promoting cultures that are inclusive and tolerant of a range of different political perspectives. Without a strategy in place, organizations run the risk of impacting their diversity and inclusion initiatives by creating another barrier that limits the diversity of thought." 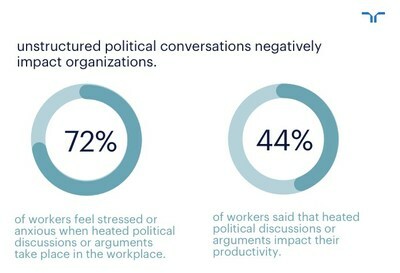 Sixty-five percent of employees say they're comfortable discussing politics with colleagues, and over a third (38%) say they've changed their opinions on political issues because of discussions they've had with colleagues. Sixty percent are careful of posting things reflecting their political views on social media networks because they're afraid of colleagues seeing them. 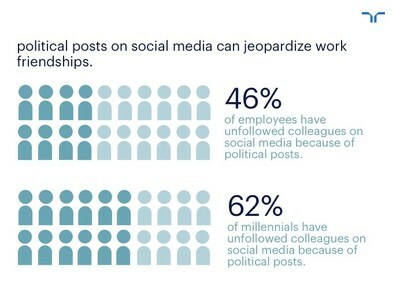 Almost half (46%) have unfollowed colleagues on social media because of political posts. Forty-seven percent feel the need to hide their political beliefs in order to fit in with senior leaders. Thirty-five percent would leave their jobs if their direct managers held very different political views than their own and were publicly vocal about them. Fifty-eight percent of respondents would not interview at companies that publicly promoted political beliefs they did not support. Thirty-nine percent would take pay cuts to move to companies that promoted causes aligned with their political values. Forty-six percent of employees say it's important for them to work for employers that take stands on controversial political issues. Over half (56%) say it's important that the charitable and/or corporate social responsibility causes their companies support reflect their own political values. Fifty-three percent want their employers to take public stands on LGBTQIA rights. Fifty-four percent say they want their employers to take public stands on immigration policy. Fifty-three percent want their employers to take public stands on gun control policy. Fifty-five percent of 25–34 year-olds believe they've experienced negative bias at work because of their political beliefs, versus just 23 percent of 50–64 year-olds. Sixty-nine percent of millennials say their thoughts and feelings about colleagues have changed after they've found out their political beliefs, compared to 50 percent of all workers. Sixty-seven percent of millennials say they'd quit their jobs over political differences with their bosses, versus just 15 percent of 50–64 year-olds. "Today, the line between business and politics is becoming increasingly blurred as more and more companies take public stands on controversial issues, which simply wasn't as common even a few years ago," said Jenkins. "Our data shows employees are split on how politically engaged they want their companies to be — but many are hoping their employers will become more politically engaged, especially millennials. As the millennial generation rises in the ranks in the workplace, I expect we'll see a shift in how companies manage their charitable and civic actions." Research findings are based on an OmniPulse survey fielded by national polling firm Research Now on behalf of Randstad US. The survey was fielded from August 13–17, 2018. It included 807 respondents over the age of 18 and a nationally representative sample balanced on age, gender and region. Randstad North America, Inc. is a wholly owned subsidiary of Randstad N.V., a €23.3 billion global provider of flexible work and human resources services. As a trusted human partner in the technology-driven world of talent, we combine the expertise and passion of our employees, with some of the most innovative HR technologies on the market today, to advance the careers and business success of our candidates and clients. Randstad's North American operations comprise 5,700+ associates and a deployed workforce of more than 100,000 in the U.S. and Canada. In addition to staffing and recruitment, Randstad offers outsourcing, consulting and workforce management solutions for generalist and specialist disciplines, including technology, engineering, finance and accounting, clinical and non-clinical healthcare, human resources, legal, life sciences, manufacturing and logistics, office and administration, and sales and marketing. Global concepts available to North American client companies include RPO, MSP, integrated talent solutions, payrolling and independent contractor management and career transition services. Learn more at www.randstadusa.com or www.randstad.ca.